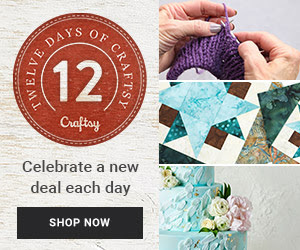 Have you used Craftsy yet? It's AWESOME!!! You need to! There are so many classes to take and so many great deals. I highly recommend it, if you haven't! Still haven't found the perfect present for the crafter in your life? Stuff their stockings with fabric and yarn from Craftsy! From Friday, December 13 to Monday, December 16, designer yarn is on sale up to 80% off and designer fabric is up to 65% off. Order by 12/16 to guarantee delivery by 12/24...sorry, this is only for US residents. Hurry over to Craftsy! This sale expires on December 16 at midnight MST.